jster txts you a funny joke about school. A perfect fit for conversations with fellow students. Everyone enjoys a good laugh - But how many times have you walked away from a conversation only to realizing a great joke you could have shared with your friends that perfectly fit the conversation. 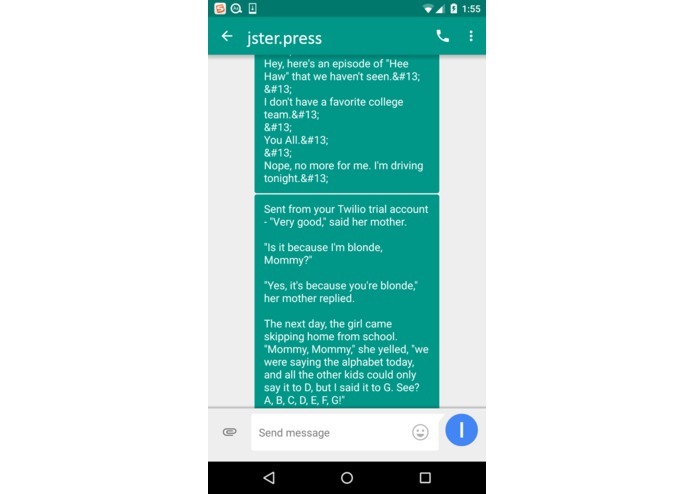 Jster helps you think on your feet so you never miss a chance to be witty. Jster texts you timely jokes relevant to the interests of you and your friends based on your twitter feeds. The responsive text msg interface makes it perfect for discreetly being alerted to jokes that you can share with your friends and seamlessly integrate into your conversations. You will not only look more sophisticated, but you will also be the life of the party. Jster is a combination of Twilio, the twitter API, and the Internet Joke Database (http://www.joke-db.com/). It is all tied together using Python. Jster examines the twitter feed of you and your friends. It uses this information to suggest relevant jokes for your enjoyment. The jokes are txt messaged to you. It was a challenge to scrape data from the twitter feeds and the internet joke database in order to ensure that the jokes were relevant and timely. The parsing of the joke text from the internet joke database is a little rough still. We managed to interface a variety of technologies and info from the web in a seamless manner. We have little experience doing this type of web application. Tools used include Twilio, the Twitter API/Tweepy, Radix domain, and the Internet Joke Database (http://www.joke-db.com/). Jokes were scraped from the internet joke database for the proof-of-concept. It was integrated using Python. There is a lot of good humorous material out there that is not being enjoyed by the public. Jster aims to set the laughter free for the enjoyment of the people. Create a simple interface allowing users to set the Twitter feeds they want to use as inspiration for the jokes jster provides. Work with humor content creators to continuously improve and expand the jokes jster shares with you. Current jokes for proof-of-concept are scraped from the internet joke database (http://www.joke-db.com/). I did alot of the programming/integration and helped with the creative process. I created the idea and helped develop the app.